Funny how someone can get saddled with something another person ought to get the credit – or blame – for. Take Jefferson Davis, a West Point graduate from Mississippi who became President of the Confederate States of America. Just about everyone knows he led the South’s unsuccessful attempt at separating itself from the rest of the Union. A lot of people also know that when Davis served as U.S. Secretary of War in the mid-1850s, he experimented with using camels as a means of carrying supplies for the Army. While true enough that as a cabinet member under President James Buchanan he signed off on what came to be called The Camel Experiment, it wasn’t Davis’ idea. 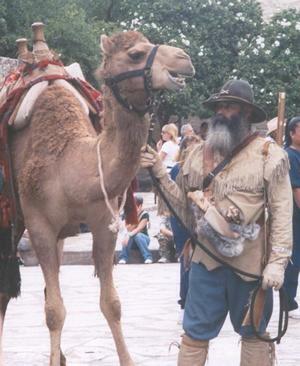 Col. George H. Crossman, who first proposed giving camels a try as U.S. Army beasts of burden during the Seminole War in 1836, is the man who should get the credit for being the committee of one who invented the concept of using camels to carry men and freight in the American desert. Crossman was deputy quartermaster general when he had the idea, though it took nearly two decades to make it happen. Like any good bureaucrat, Crossman tasked his assistant with looking into the matter further. Maj. Henry C. Wayne set out to learn everything he could about camels. He read up on them in Washington, and consulted with the French minister, who had spent time in Persia and knew much about the beasts. Satisfied that camels were indeed a good idea for the U.S., Maj. Wayne forwarded to the Secretary of War a report suggesting a camel program. He could make it happen, he said, for $30,000. And he did. A shipment of 33 camels arrived at Indianola on May 13, 1856 and the Army began using what one 19th century writer referred to as “ships of the desert” in Texas, New Mexico and Arizona. The camels could travel up to 50 miles a day while carrying up to 600 pounds of supplies and equipment. They didn’t need much water and could ingest almost any plant. Initial experiments with the camels having shown promising results, the Army brought 41 more of the animals to Texas in 1857. Though no one could deny that camels came particularly suited for operations in arid climes, few soldiers or teamsters felt highly of them. The animals required difficult-to-use harnesses and other tack. Packing camels proved a lot more difficult than loading up horses or mules. On top of that, the unusual looking and different-smelling beasts made the cavalry horses nervous. “The military officers found it hard to get any hostler to attend to the camels, towards which all the cavalrymen and troopers took a violent dislike,” the San Francisco Chronicle reported in 1895 in an article reprinted in Texas. 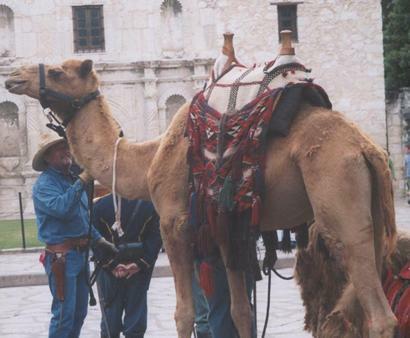 Just as Crossman and Wayne’s role in the Army’s camel unsuccessful experiment is not well known, a private sector attempt to put camels to good use in Texas never got much ink, either. A British ship carried two loads of camels to Galveston in 1858 for private use. After being offloaded, the animals were transported to the Watson Ranch, near Houston. While the camels earned their keep as pack animals, the ranch owner eventually gave up on the idea because they caused too much commotion when someone from the ranch took them into Houston. “In the last year or two of their stay at [military garrisons including Camp Verde in Kerr County] they were merely pensioners upon Uncle Sam’s bounty, and were never brought into service,” the Chronicle said. The outbreak of the Civil War ended any military interest in camels. 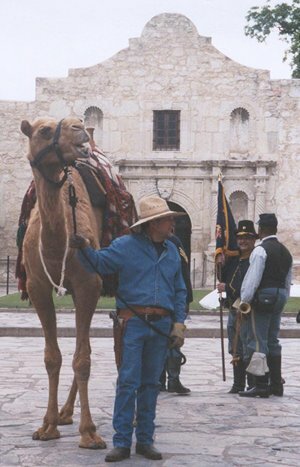 When federal forces abandoned Texas, the camels stayed behind left to fend for themselves. However, some of the animals proved they could cling to life as tenaciously as their systems could conserve water. “Many a passenger on the Southern Pacific railroad trains has had a sight of some gaunt, bony and decrepit old camel away off in the distance,” the newspaper article related. By the mid-1890s, nearly four decades after their introduction to Texas and the Southwest, the camels had just about died out.